Support from Cranfield Trust volunteer Michael Lofthouse has enabled Positive East’s volunteer programme to be embedded and ensured national recognition for their services. Positive East is London’s leading community-based HIV charity, delivering practical and emotional support for people living with and affected by HIV in east London. 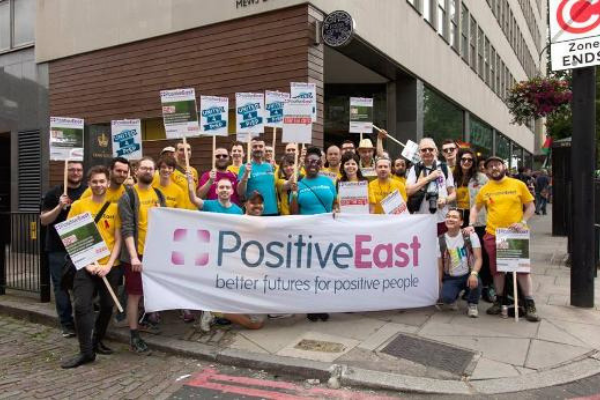 Working in partnership with other HIV organisations, Positive East has between 1500 and 1750 clients receiving support during the year, provided by 30 staff and between 70-100 volunteers. Some years ago the charity determined to involve service users, working as volunteers, in the delivery of services in order to increase the service user base capability and encourage independence. Additionally, with the ongoing increase in demand and the continued threat of funding cuts, it became apparent that its ability to deliver quality services was becoming increasingly reliant on the use of a larger number of volunteers. It was therefore agreed that a robust and structured volunteer programme should be put in place. Following substantial investment in process, documentation and monitoring, it was expected that numbers would more than double from the current level. Finance Director Alastair Thomson led the restructuring but recognised that Positive East would benefit from external support in validating work done, as well as in reforming and updating the management of the volunteer process. Roger Watkins, London Project Manager with The Cranfield Trust, worked with Alastair to compile a realistic brief, before matching him with Michael Lofthouse, a longstanding volunteer for the Trust. Furthermore, Alastair was keen for Michael to advise him on the level of paid resource the charity would need to maintain the volunteer programme effectively but at optimal cost, considering too the workloads of the volunteer central function. Michael therefore helped the charity to implement a monthly review of their key performance indicators around cost per area in order to measure progress against targets. All those involved in the project were delighted when Positive East subsequently won a Queens Award for Voluntary Service in 2014.